If you'll go back with me I am sure you'll agree that the days which we loved most of all Were the ones spent at school and the old swimming pool with the playmates we fondly recall Just think of your sweethearts first kiss What on earth could be sweeter than this. Don't your eyes fill with tears when you think of the years that are gone and will never return You remember the names of those sweet childhood games and the lessons you tried hard to learn In fancy again it would seem All those beautiful things were a dream. 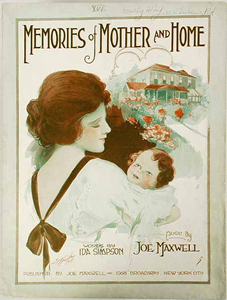 Mem'ries of mother and home Treasures that each heart has known Things to remember in lifes December when childhood days have flown My dear old dad used to say You'll find when you're far away More than riches and gold more than fortunes untold are mem'ries of mother and home.